For example, if you have a teenage driver in your household, you know that your insurance agency will give you a discount for good grades. Insurance companies do this because there is a high correlation between high GPAs and safe driving records. However, a high correlation does not mean that all drivers with high GPAs will not have accidents (our household is a great example that this correlation is not 100%!). However, the correlation remains high enough that insurance companies are willing to provide discounts for teenage drivers with high GPAs. Lending Clubs are taking a similar approach to the insurance industry by expanding the set of criteria used to evaluate a potential borrower. Their analytics platform takes into account far more critical factors than do traditional loan analytics. This is only possible because we live in times of unprecedented access to data. As a result, Lending Clubs are pushing against the boundaries of traditional lending risk management. The problem with FICO scores isn’t just that they’re an incomplete metric for loan analytics. Even though they err on the side of caution for credit unions, they limit the kind of good, eligible customers that credit unions should want. Fortunately, there is a plethora of data available today that will enable “analytic” based lenders to access a market of borrowers with great future potential who don’t have great FICO scores. Lenders who incorporate other relevant information and look beyond traditional loan analytics can increase their loan portfolio while still mitigating risk. As a personal example, I applied for a car loan after I graduated from college. I was 1,500 miles away from home and walked into the local branch of a bank that my family had banked at for years. Yet, my auto loan application was rejected. The fact that I was a business school graduate with a well-paying job did not make any difference. A week later, I walked into a credit union and met a loan officer named Louise. Louise not only approved my car loan, but also went on to set up a monthly savings plan. I remember her name to this day because she was able to see beyond the FICO score and used other data to assess my future potential as a reliable borrower. In 2018, Lending Clubs are using Big Data and loan analytics to make fact-based assessments to determine loan risk, much like Louise did. Both credit unions and potential borrowers can benefit from better loan analytics information. The fact that brand new drivers with little-to-no road experience reap the rewards from data correlation, but that adults with stable jobs don’t is alarming. Without updating the old-fashioned loan analytics platform, credit unions will miss profitable loan opportunities. Just as importantly, by not offering loans to people with low FICO scores but who are otherwise qualified, credit unions can’t provide critical services to their best members. Credit unions live in an unprecedented time. Never before have they been able to access this much data about their members both internally (data within the credit union) and externally (data outside the credit union). 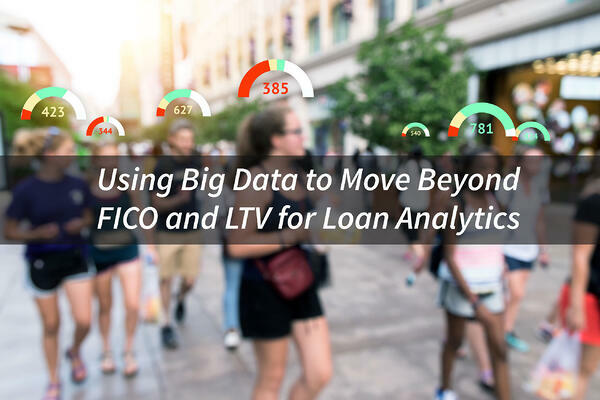 It is time for this industry to “think differently,” and look beyond FICO and LTV to embrace the upside potential of Big Data and loan analytics for improving lending practices.